Known as the hotel that inspired Stephen King to write The Shining, the Stanley Hotel hosted both the novelist and his wife Tabitha for one night in October 1974. But one night in the mountain resort of Estes Park was all it took. Rumors are the Kings were the only guests at the Stanley Hotel that night - one of the last nights before the 155-room hotel shut down entirely for the winter. They stayed in Room 217. The next morning, the prolific, world-famous writer came up with ideas for one of his most famous books of all time. The Stanley Hotel - image via Google. What happened that night to inspire the novelist to write The Shining? Perhaps he wandered through the hotel’s deserted hallways and bumped into a few otherworldly guests? Perhaps he ate alone in its grand dining room and had a meaningful, interesting chat with a mysterious bartender? Whatever it was, a few years later in 1977, King published The Shining which went on to become an international bestseller classic that sends chills down its readers’ back. 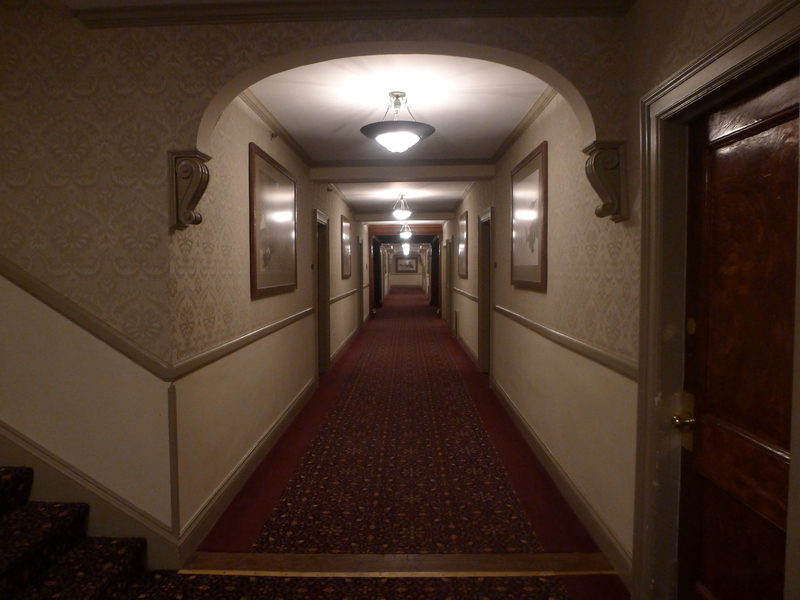 One of the cavernous hallways at the Stanley Hotel - the inspiration for Stephen King's The Shining. Image via Google. The hotel in King’s book is named The Overlook. Other than sporting a different name, it’s practically a twin of the real-life Stanley Hotel. Both have Georgian architectural style, sprawling porches fronting its facade, and were built in 1909. The Stanley Hotel’s original owner was Freelan Oscar Stanley (the inventor of the Stanley Steamer, one of the most famous steam-powered cars of his time). He and his wife Flora moved to the Rocky Mountains from Massachusetts in 1903 for health treatments for his tuberculosis. Six years later, they founded the Stanley Hotel which during its heyday hosted numerous famous personalities, including former U.S. president Theodore Roosevelt, Molly Brown (a Titanic survivor), and Japan’s Emperor Hirohito. Hotel guests over the years have claimed to see the Stanleys’ spirits wandering around the hotel. Mr. Stanley has been spotted at the hotel’s front desk, keeping an eye on things. Mrs. Stanley still plays the piano in the music room. Numerous guests have heard piano music coming from the music room even when no one is at the piano. The Music Room at the Stanley Hotel - where guests sometimes hear piano playing even though no one is sitting at the piano. Image via Google. In The Shining, King describes the door to Room 217 as “a perfectly ordinary door, no different from any other door on the first two floors of the hotel.” But what lies beyond that door is everything but ordinary. It turns out Room 217 has a real-life history. In 1917, the hotel’s then housekeeper Elizabeth Wilson was in Room 217 lighting lanterns when one of the lanterns exploded, causing the floor to give way sending the housekeeper down to the level below. She somehow survived the blast but guests of Room 217 swear they still see her spirit in the room now and then, tidying things up. All this history makes Room 217 quite popular with the curious guests. Booking for Room 217 tends to fill-up months in advance. The hotel’s fourth floor rooms, however, have the most sightings of spooky activities, such as sounds of children playing, lights mysteriously flickering on and off, and shadows gracing its windows. The door to Room 217 at the Stanley Hotel. Image via Google. Room 217 at the Stanley Hotel - image via Google. 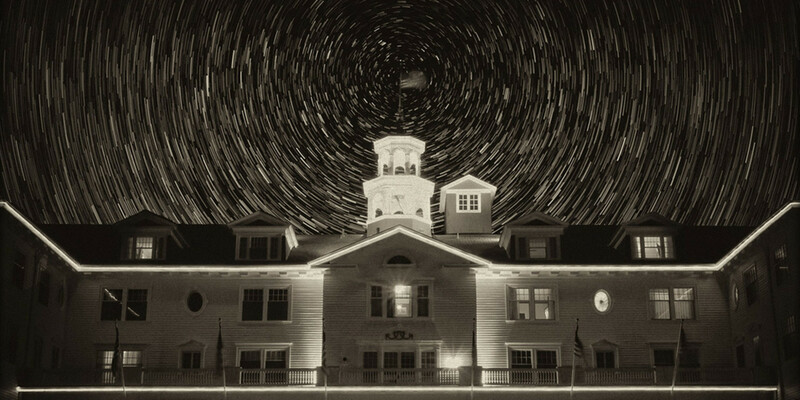 Even though King’s inspiration for The Shining is the Stanley Hotel, the Stanley Kubrick film based on his novel (starring Jack Nicholson) was filmed at the Timberline Lodge in Mt Hood, Oregon (for its exterior scenes). King was not happy with the Kubrick adaptation (it wasn’t true to his book). In 1997, the author adapted his famous novel into a television mini-series and filmed it entirely at the Stanley Hotel. If you haven’t seen either films, you should check them both out. The Kubrick version is fabulous with Nicholson as Jack Torrance, the mini-series is authentic because it was filmed at the actual Stanley Hotel where everything started for the author. Reveling in its reputation as one of the country’s most haunted hotels, the Stanley today runs several professional guided ghost tours, ranging from a 90-minute walking tour that includes the hotel’s history and “all the paranormal predilections of the property and the spectacularly creepy underground tunnel,” to the famous Night Ghost Tour that takes adventure-seekers on “a special lights-out ghost adventure” for “an in-depth look at all the apparitions of The Stanley Hotel,” to a full-blown 5-hour Ghost Hunts/Paranormal Investigations that take guests to some of the hotel’s most haunted places. A room by the main entrance of the Stanley Hotel. Image via LocationsHub.com. In September 2013, the Stanley Hotel was in the spotlight again when King published Doctor Sleep the long-awaited sequel to The Shining. In the new novel, Jack Torrance’s only son Danny - now an adult - returns to the Overlook Hotel. To entice its guests, the Stanley now offers a special "Doctor Sleep Package" through 2015. With this package, guests will receive a hardcover copy of Doctor Sleep and a paperback copy of The Shining, in addition to their luxury accommodations at The Stanley Hotel with a faint promise that Room 217 may also be available. This year for Halloween, the Stanley Hotel hosts a Murder Mystery Dinner, a Ball, and tonight ... a Masquerade Party. Not for the faint of heart, I'm sure. Happy Halloween! For information on filming in Colorado, visit our client the Colorado Film Office. BANNER PHOTO CREDIT: Banner image via Google.